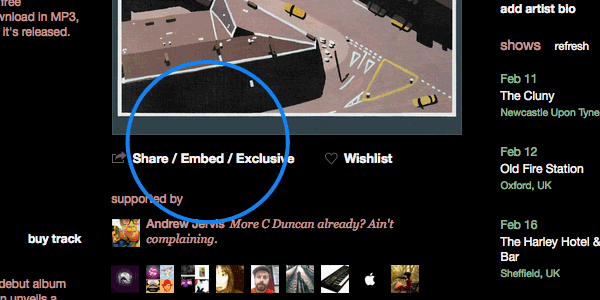 Today, music discovery platform Bandcamp announced a new feature, exclusive embeds, that make it easier for artists to share (or restrict) their music. Now, music sites like Pitchfork, can work in conjunction with artists to offer readers an exclusive first listen of a track, or complete album. The streams don’t have to be available from a public Bandcamp profile, but give you options on specific songs they want to share, and with whom. Exclusive embeds can also be restricted to just the sites an artist specifies. For example, if an artist wants to debut a track exclusively for Pitchfork readers while giving Stereogum another, they can. To use the new feature, the album must be a pre-order, or — if you’re a Bandcamp Pro subscriber — an album that you’ve disabled streaming on for the track (or album) you intend to share.